Dr. Davis has no disclosures relevant to this article. Dr. Austin has disclosed that he is a consultant for Tornier. An anteroposterior view and scapular-Y view of the left shoulder were obtained in the emergency department (Figures 1a-b). Figures 1 a-b. 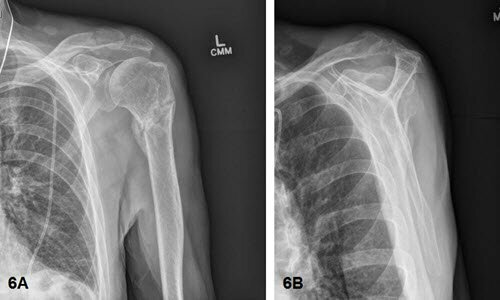 AP (left) and scapular-Y (right) views of a 2-part proximal humerus fracture. Type of procedure: Closed reduction and external fixation. Note: The patient had significant medical comorbidities and was a high-risk candidate for general anesthesia and contraindicated for intubation. Therefore, he was under light sedation with local anesthesia over the shoulder. 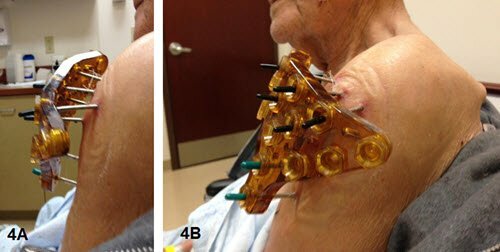 Figure 2 a-c. NBX Shoulder external fixator used in this procedure. The patient was positioned supine on a regular bed, with his affected arm draped free. Prior to draping, the OR staff ensured adequate AP and axillary views could be obtained to confirm closed reduction. The C-arm was placed at the head of the bed. Light sedation was obtained by anesthesia with ketamine. A patient under light sedation can be bagged as need. Local anesthesia was obtained with Marcaine. A regional block can affect the phrenic nerve and lead to unintended intubation. 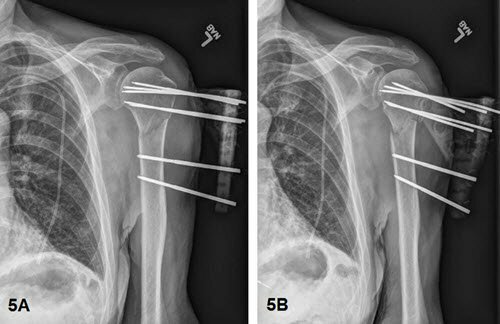 A 3-mm pin was placed through the superior lateral greater tuberosity and advanced into the humeral head. 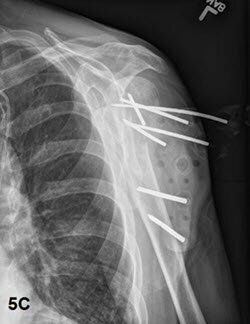 The fixator was placed on the first pin and the distal fin of the fixator was aligned with the long axis of the humeral shaft in the reduced sagittal position prior to tightening. Two additional 3-mm pins were placed through the fixator, anterior and posterior the first pin. This allows for complete control of the humeral head. Manipulation and reduction of the fracture was then performed. This is usually done via traction and elevation of the arm in the sagittal plane. Sagittal plane reduction is critical. 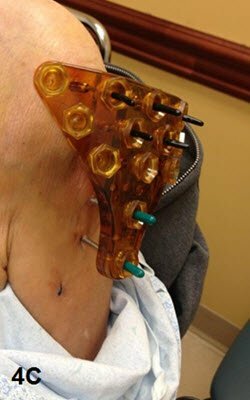 Two 4-mm half pins were placed through the distal fin of the fixator and into the humeral shaft. The head was reduced on the shaft and an external fixation device was used to secure the fracture in a reduced position (Figures 3a-b). Two final pins were placed into a more distal position in the humeral head and also secured in the external fixation device. 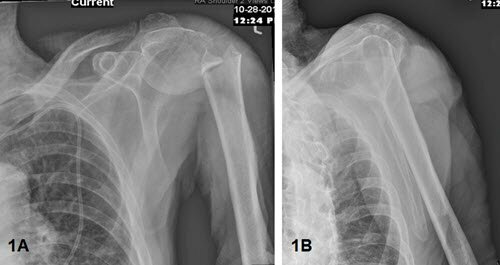 Adequate reduction was assessed with AP and axillary shoulder fluoroscopic images in the operating room. Figures 3 a-b. External fixation device secures the 2-part proximal humerus fracture in a reduced position. Figures 4 a-c. Fixation device in position 2 weeks postopertively. Figures 5 a-c. Radiographs confirm continued adequate reduction 2 weeks postoperatively. Figures 6a-c. At the 6-month follow-up visit, radiographs show continued bony healing with no loss of reduction. Daniel Davis, MD, and Luke Austin, MD, are from The Rothman Institute, Philadelphia, Pennsylvania.